The human brain is the primary source of joy and misery. Our brain chooses how to interpret information it receives both inside and outside of the body. In actuality, we may not be slaves to our brain’s seemingly autonomous control over our reactions and emotional state. Before Gautama was named the Buddha, he was a prince who lived a secluded life. His father, the king of an Indian tribe called the Shakyas, sought to isolate his son from any knowledge of religion and human hardship. In Gautama’s late 20s he ventured out and almost instantly was confronted with the realities of the true world. In this new unfamiliar world outside of the palace, he witnessed human suffering, frailty, and above all, the delicacy of life. Gautama realized that he was far from understanding the problems of the real world. Upon witnessing an ascetic (one who is devoted to the absence of self-indulgences) who was withering away from refusing the most basic of indulgences: food and water, he found a new life purpose: to find the solution to human suffering. In that moment of inspiration, Gautama was told that when ascetics deny indulgence, they also renounce humanity’s instinctual and perpetual evasion of the fear associated with death and suffering . Simply put, ascetics sought to relieve human suffering not through the evasion of suffering, but through its acceptance. In theory, if a problem becomes accepted, it is no longer perceived as a problem. Gautama was inspired by this revelation and soon adopted ascetic practices in hopes to find the solution to human suffering because it was a negative phenomenon that all humans were plagued with. At the brink of starvation (he was denying himself indulgences/food/water to find the solution to suffering), he accepted a bowl of rice offered by a young girl and realized that rigid ascetic practices were not the answer. That night Gautama sat under a Bodhi tree and vowed to remain there until he discovered the solution. To bring this long story to an end, after sitting under the Bodhi tree for a good deal of time, he found “the answer” he became known as the Buddha. Not knowing how to put his answer into words he began to teach his way of living and the art of meditation. Without getting too much into the history, the art and practice of meditation became institutionalized in religion (Buddhism). Other religions have similar practices to meditation such as prayer. Even though meditation has been found to have so many health benefits, it has struggled in the modern world of medicine to gain the recognition it deserves. Since meditation has so much religious and historical baggage, it is difficult to perceive it as anything but a religious practice. If you find it difficult to put yourself past the religious stigma of meditation, then this article may help you do just that. Hopefully I can enlighten you with a new modern perspective based on scientific evidence. Much like physical exercise, meditation is simply mental exercise that can be used in your life to improve your overall health. Research suggests that anxiety disorders, asthma, cancer, depression, heart disease, high blood pressure, pain perception, and sleep complications can all be helped/managed through the practice of meditation . Meditation, however, does not serve as a substitute for traditional medical treatment. It is best used in combination with primary treatments. Of course it is always important to consult your healthcare practitioner because in rare cases, meditation can increase anxiety. Now let us explore some specific studies regarding the efficacy, or effectiveness, of meditation. MRI scans revealed decreased activity in the somatosensory cortex for those who meditated, which is a region in the brain associated with pain perception. 2. Meditation is a powerful management tool for the reduction of anxiety, negative emotions, and neuroticism (i.e. tendency to be in an emotionally negative state of mind) . 3. Meditation has been shown to reduce the expression of genes associated with inflammatory responses and stress [6, 7]. There was also a noted increase in gene expression in those which are involved in energy metabolism and insulin secretion. 4. Mindfulness meditation may increase overall well-being, which in turn can increase longevity (i.e. slowed biological aging) . Although the study is somewhat unrealistic for people to apply to their lives (because the participants meditated for 6 hours a day), the study does reveal that meditation increases telomerase activity (an increase of 30% in this study). As telomeres deteriorate, cell-replication gets increasingly ‘sloppy’—this phenomenon is attributed to the aging process. Telomeres are often compared to a shoe-lace cap: they prevent the shoe-lace from fraying. 5. Those who practice mindfulness meditation, are suggested to have lower stress hormone levels compared to people who do not meditate . In this case, cortisol levels have been shown to be lower in those who meditate. Cortisol is a stress-hormone that is produced by the adrenal glands during a stress stimulus; the glands are located just above the kidneys. 6. Improved Concentration (I, along with many others could undoubtedly benefit from this) has been correlated to mindfulness meditation . In this study, mindfulness meditation training has been shown to help employees concentrate better at work, remember work details, stay energized throughout the day, and experience less negative moods. 7. Meditation may improve your immune response . Following a flu vaccination, those who were taught to meditate were found to have a significantly higher number of antibodies (that were specific to the vaccination) compared to the control group. Antibodies (also called immunoglobulin or Ig) is a protein in the body that is used by the immune system to identify potentially harmful bacteria or viruses (antigens), which, in turn, can trigger immune responses. 8. 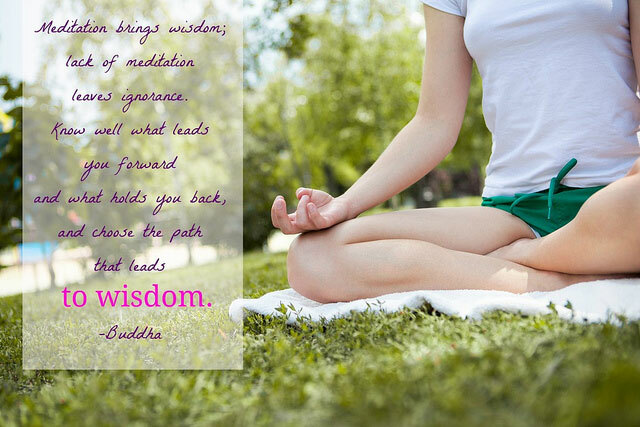 People can experience decreased levels of depression with meditation . 9. A study by the American Heart Association suggests that transcendental meditation significantly reduces the risk of mortality (death), myocardial infarctions (heart attacks), and stroke for people with coronary heart disease . Meditation promotes relaxation which is associated with increased levels of nitric oxide. Nitric oxide causes blood vessels to expand and thus blood pressure drops which reduces the heart disease related risk factors such as myocardial infarctions. 10. Loving-kindness meditation has been shown to significantly increase the amount of daily positive emotions (which can arguably be considered increased happiness) . Participants who practiced the mandated meditation in this study were reported to have an increase in life satisfaction and decrease in depressive symptoms as a result of the increased frequency of positive emotions. Increases in ‘personal resources,’ such as mindfulness, a sense of purpose in life, and social supports, were also noted in those who meditated. The human brain is the primary source of misery and joy. Our brain chooses how to interpret information based on its various stimuli. In actuality, we may not be slaves to our brain’s seemingly autonomous control over our reactions and emotional state. Through my own personal experience, it is apparent that meditation gives us a higher degree of control over our mind and how it reacts. Through meditation, I have noticeably decreased my negative reactions to things that tended to annoy or anger me in the past. The study, discussed earlier, found employees who were instructed to meditate resulted in decreased negative moods and increased concentration  explains my personal changes. Work can be notoriously busy and stressful; both can decrease how positive you feel and your level of concentration. I am sure many people can relate to the loss of concentration in highly stressful situations. In short, the participants in this study changed their interpretations and how they reacted to a stressful/busy work environment. It appears that meditation could be a great practice to implement into your life for the numerous health benefits. Moreover, many of the health benefits seem to stem from the stress reducing effects of meditation. So, data does suggest that meditation ‘really works’ and does produce therapeudic effects. Part two of this article explains how to perform 3 different types of meditation. Please share this article! We really appreciate any support!